How much difference does a year of schooling make in the development of the brain? New research from Stanford University, published in the journal NeuroImage, suggests that problem-solving ability improves from second to third grade in ways that are associated with changes in the brain. The researchers believe these brain changes are the result of skills that the children are acquiring in school, although the study did not show cause and effect. "It address both questions of how the brain improves and how children acquire new knowledge," said Vinod Menon, neuroscientist at Stanford University School of Medicine. Researchers looked at 90 children, half of whom had recently completed second grade and the other half whom had just finished third grade, aged 7 to 9. They did not all go to the same school. Participants had normal intelligence and scored between the 25th and 98th percentile in math reasoning. Third graders tended to have better math reasoning skills, and were about one year older than the second graders. They found that third graders' brains responded differently than second graders' when doing certain mental calculations. Researchers gave the children both simple and complex addition problems. In the easy calculations, one of the numbers being added is 1. For the more difficult problems, they had to add a number between 2 and 9 to a number between 2 and 5. In general, the third graders were more accurate at the math problems than the second graders, but still not 100%. While the second graders' brains treated these kinds of tasks similarly, third graders showed distinct brain responses for simple and difficult problems. The older children showed greater engagement in a brain system related to quantity representation, and in another related to working memory. The third graders' brains also showed greater "cross-talk," or signal transfer, along pathways that deal with information between those two regions, and help with more efficient numerical problem solving. 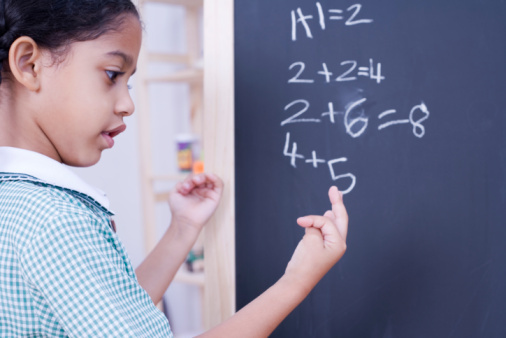 "Hopefully at some point we'll be able to translate and use this information to examine children with dyscalculia and related learning disabilities," Menon said. There's not enough evidence for specifics yet, but the idea is that brain imaging could inform educational interventions for these children. Understanding the parts of the brain involved in children's math skill development could lead to tutoring or other cognitive paradigms for children with learning disabilities, Menon said. The next step is to follow individual children through years of schooling to see how their brain responses change. The researchers will also look at children with autism and other developmental disabilities to examine their brain responses in problem solving. « Previous entryCan you make keratosis pilaris go away? So a third grader answers math questions better than a second grader... and it proves their brain is developing...? I think that goes without testing or proving. @Sam, that's not the point of the research at all. The observation is that there's a leap in a child's ability to think and reason, particularly mathematically, during the 3rd grade that warrents closer examination. The researchers are taking the simple observation that a year later/a grade level higher, a child's brain not only does better, but does better more significantly than the previous two years. The study seeks to understand how and why, and how that pertains to the way our education system either works or fails in structuring what children learn and when. So.... young children that are a year older and have had one more year of school perform better on math and reasoning tests? Say it ain't so!! It took a PhD at a major university to come to this obvious conclusion?? Really? Wow! Do you think kids of average intelligence in high school might do even better?? Hey! I think I may have just earned an PhD at Stanford! I don't understand why they did this cross-sectionally (with different groups of kids at different ages) instead of longitudinally (tracking the same kids). MR is considered to be risk free for basic structural, function, and connectivity analyses so no radiation concerns. I occasionally review for NeuroImage - I'd probably have rejected this one. That's not a cut at the authors who do good work, but just based on the fact that a year is not a long longitudinal study. Imaging guy, no offense but a longitudinal study can take 10 to 20 years. With researchers and research assitants on staff for that length of time, you're talking about some serious dollars. The cross sectional design allows us the opportunity to see it all now; thus saving thousands of dollars and giving us some insight. If the insight is useful we can go on and do a longer study but there's no sense in spending hundreds of thousands of dollars first, only to find out that there's no reason to go on looking at the subject. The study design was appropriate for initial research. Aside from that it's useful to see when the critical periods are actually occurring. If we can begin to pair maturation with gene activation then invention measures for a whole host of conditions because much more plausible. Timing is key. WOW! I looked closely at the arithmetic problems presented to the kids. These are problems all 2nd graders in the second half of the year should be able to do correctly nearly 100% of the time. This "methodology" piece of the study unintentionally points out the horrible state of education in this country. What did all of you do with your time before internet posting began. All I see are frustrated people that want to see their comments in print even though most comments aren't even about the article in question anymore. Don't bother to point out that I, also, posted a comment... and don't bother to correct my grammar or punctuation. I won't be coming back to this page to see it anyway. Another sentence that could have been rephrased – " They did not all go to the same school". It could have been "All of them did not go to the same shcool ". The classic English is getting killed slowly by these reporters !!! What happened to my previous post? Interesting report, but not surprising. As a professor who trains future teachers and a former public and private school teacher in areas spanning K-8, gifted, regular, and special education, I can affirm this critical period between 2nd and 3rd grade. The brain makes ( or doesn't) a huge jump at this point. Neural pruning or neural connecting takes place in a mysterious, yet powerful way during this time. That is why we see so many referrals for ADD, LD, and other learning problems in 4th grade. It shows up when parents and teachers see clearly "what didn't" happen during that critical year. In my 2010 book "Differentiated Pathways of the Brain" I offer parents and teachers some practical strategies for enriching home and school experiences that might massage the neural plasticity during this period. As many of the other readers noted, however, the most important thing(s) to do are to 1) Read to your children; 2) Encourage active play that allows for spatial reasoning; and 3) Engage with your children in activities that help neurons connect, like cooking, crafts, outdoor games, chores, and even board games and riddles. Dr. Linda Karges-Bone, Education InSite http://www.educationinsite.com for free help to parents! Ahhh the 3rd grade! i remember it like it was yesterday. there was a math problem on the black board. it was my turn. i rose up, knowing the answer already. chalk clutched between my sweating fingers. knowing the answer, yet nervous that i may be wrong. I approached the black board slowly, and placed the tip of the chalk against it. i could smell the chalk from previous use, and the heat from my fingers being drained into the black board. it was time to write the answer. "8," i told myself repeatedly. And then, i wrote the number 8 on the board with one continuous motion. but what came out wasn't just an 8, it was the most perfect and beautiful 8 i have ever seen. The air must have been vaccuumed out of the room as i heard gasps from the other students and our teacher. The "8" was perfectly symmetrical. People have boasted of drawing the perfect circle. "pshaaawww," i tell them. Mine 8, contained 2 perfect circles, and in only one motion. 8 ??? That's nothing... I can draw a ' I '. Aw te you what,.. aw te you what,... I aint puttin' my kid in no 3rd grade. I was always very good in math...until I hit 3rd grade. I became increasingly worse and my confidence went down. It wasn't until I got into college that a professor pointed out I'd copied my numbers incorrectly on my exam where I had to show my work. I went back to many earlier quizzes and tests and noticed that many times I'd flip the last two digits while copying the problem. I'd had dyscalculia all this time, and I'd never known it. Once I started paying attention to it, I was able to get the correct answer every time. It really upsets me that It wasn't caught sooner. My grades throughout Jr. high and High School would have been so much better! I think that you're all wrong. I'm 13 years old and when I was in 3rd grade, I was given homework everynight. Look aty me now ,fools! I specifically remember my third grade teacher, not a nun, in a Catholic school. I came to realize that I did not like the way she treated some of the other kids. I surprised myself with the insight that teachers, like other adults, could be unfair and unkind. From then on I became aware I did not have to assume those in charge knew what they were doing. Third grade is the year when a child changes from learning to read to reading to learn. Concrete concepts move to inferential reasoning and maturation of the brain's white matter makes a big leap. All these factors support what the study measured. This is also the year many students are identified with learning disabilities as the gap widens. Third grade teachers are crucial and we need to support education with our votes, emotional support and investing time in the classroom and with our kids. 3rd grade WAS the difference for me. In second grade I was smarter then eveyrone else. AFTER third grade I started failing because the education system has such a cookie cutter mentality that I never got the hang of! By grade 5 I was lucky just to advance to the next grade! After I dropped out in highschool I was able to undo much of the damage that had been done but I'm sure I never fully recovered. I don't think ANYONE should be forced to learn from a school system like this. kids would be better off developing naturally and just picking up a book every now and then until they're in their teens and figure out what their interests are. If you don't know that "then" and "than" aren't the same, you're not smarter than anyone other than my cat. I just look at pictures. when I was in 3rd grade I would drift off into dreamland for hours at a time during class. The teacher put a box around my desk to help me concentrate lol that just helped me tune everything out and really concentrate on my day dreams. She was kinda hot too. Hi Mark, your response caught my attention. I am doing research on why scores decline from 2nd grade to 3rd grade. Can you give me some insight on why you think the educational system was "cookie cutter" after 2nd grade. I need examples if possible. I doubt this is universally based experiment. Some parts of the world don't even have eduction for their children. And what the heck does "religion" have to do with this article?